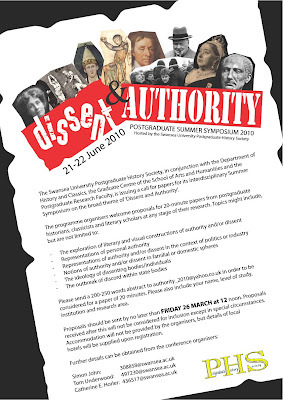 The Swansea University Postgraduate History Society, in conjunction with the Department of History and Classics, the Graduate Centre of the School of Arts and Humanities and the Postgraduate Research Faculty, is issuing a call for papers for its interdisciplinary Summer Symposium on the broad theme of 'Dissent and Authority'. Please send a 200-250 words abstract to authority_2010@yahoo.co.uk in order to be considered for a paper of 20 minutes. Please also include your name, level of study, institution and research area. Proposals should be sent by no later than FRIDAY 26 MARCH at 12 noon. Proposals received after this will not be considered for inclusion except in special circumstances. Accommodation will not be provided by the organisers, but details of local hotels will be supplied upon registration. Further details can be obtained from the conference organisers: Simon John; Tom Underwood; Catherine E. Horler.